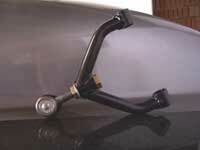 Originally, I wanted to replace the upper and lower a-arms on my car with custom tubular a-arms. After studying the amount of work and jig building that it takes to fit a specific car, I was resigned to my existing a-arms -which are working just fine. Then while searching, I came across the Canley Classics tubular upper a-arms. They were capable of adjusting the camber. They looked great and with a leap of faith, I ordered a set. When I received them I was very pleased. They have substantial construction and a great way to adjust the camber. 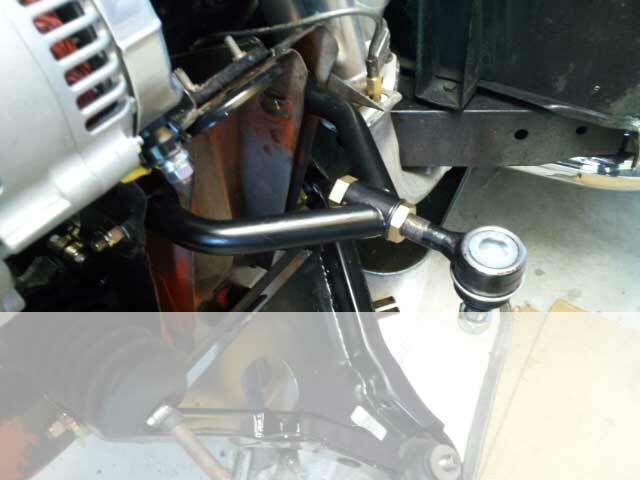 They use a heavy duty threaded steering rod end with a machined, threaded bronze insert and lock nut. The background image shows one of the a-arms installed in my suspension. The following photo shows a Canley Classics a-arm.